www.xrtwo.com • View topic - Fiesta xr2 zetec turbo build !! Fiesta xr2 zetec turbo build !! 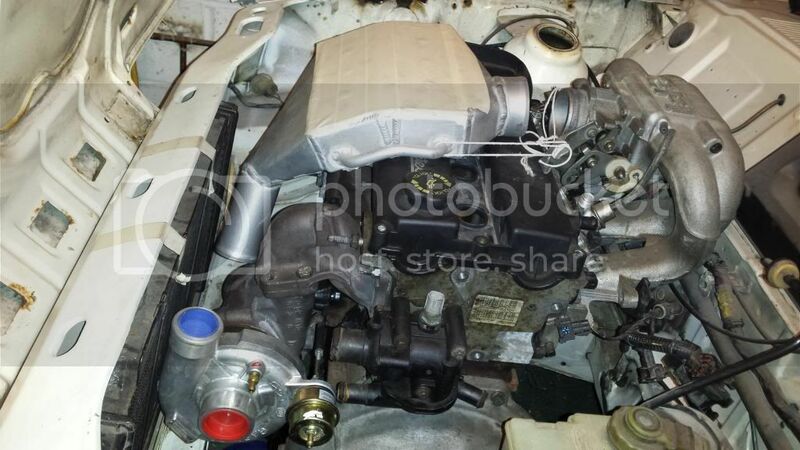 Post subject: Re: Fiesta xr2 zetec turbo build !! oh man, i have loads of bad news for you!!!! your maths is a bit off really, you have 57mm either side, pipe will be 51mm, hoses connecting up will have 4-5mm walls or will blow apart with any decent level of boost so you're up to 59-61mm in total, then consider the pipes move when applying throttle and boost, you don't want these being chewed by the front panel either, so i'd be allowing 8-10mm for this, believe me engines move quite a bit and i had mine rock solid i thought. next up, what fan will you use? even a slim line kenlowe (and i recommend one of those not a cheap crap copy) will struggle to fit with enough clearance not to melt after a blast and sitting in traffic. next up, most universal coolers are wider than a rad, so the outlets will protrude beyond the gap in the front panel, if you go smaller it won't have the length for cooling to be efficient, talls ones don't cool as well as long ones. at some point is will be positive, but not on this subject i'm afraid, fiestas have to be cut if you want it to work well, charge cooler is the other option, better for quick blasts rather than holding on boost for a long time. I should of mentioned before sean. I'll be using the solid aluminium pipe to get around the radiator. So measurement there should be pretty spot on. I will be spacing the intercooler slightly from the from panel to give me the room for the hose connections( and to give a little extra space between the rad and cooler for a fan)I may even solid mount the pipe around the rad to limit any movement. I haven't though about a fan yet but a slimline kenlowe is looking like a good choice. If It will fit I may even fit two one In between the rad and cooler and one on the rear of the radiator for extra cooling when needed( providing it fits). I have 3 different cooler design that will fit, but finding the sizes seems harder than I thought so it may have to be custom made. They range between 535mm and 640mm length with either a 60 mm or 80mm core (not sure which would be better ). I have looked into charge coolers. And they all say the same that they are only good for a quick blast. Thinking about it, it won't be going around track so wouldn't really be too much of issue. I would prefer an intercooler but if its impossible to fit it then charge cooler it may have to be. 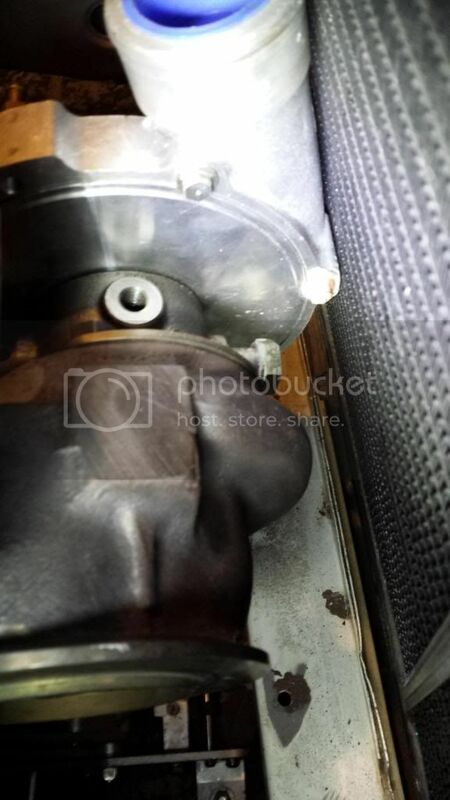 If you are using the FRS turbo and manifold you won't have space on the back of the rad for another fan and the compressor housing will sit about 10mm from the rad. You could always use a shorter rad aswell, I have R5 GT Turbo rad on mine and that was fine, did have to cut the top part of the front panel to get it to fit tho as it's taller than the XR2 one. You can also get them with an oil cooler/heat exchanger built in. I had water cooling on the turbo aswell and it never got above 90 deg. I have a chargecooler on mine. Temps never crept up once on it. You just have to make sure the rad is big enough. Would make life alot easier for you as the hoses are only 14mm ID I think and I had a small cooler mounted above the gearbox. There are pros and cons to using both. 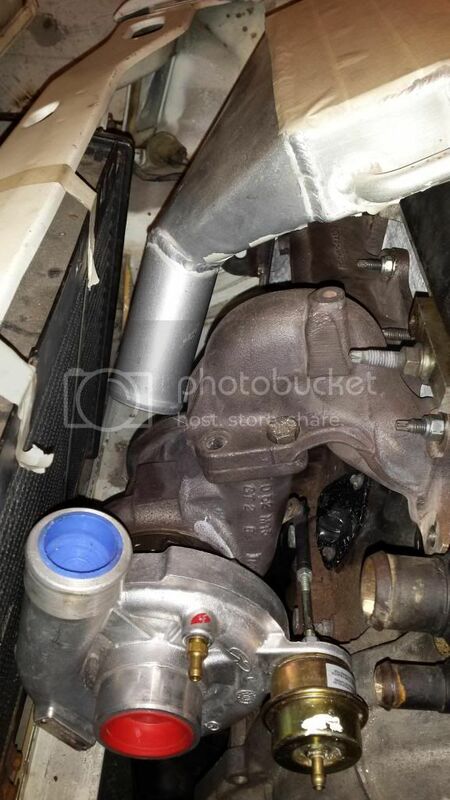 I'll be using a focus rs turbo and manifold. When I fitted it up earlier it was to close to comfort to the rad. So I'm going to modify the bottom of the rad so it fits slightly further forward to give me some extra space. I'm trying to avoid cutting the front panel at all costs. Do you have a picture of the rad you have fitted ? I'm still considering fitting a charge cooler instead. Do you have any pictures of it fitted ? This is all the info on mine. I did read it through ! You must of been livid!! did you end up salvaging it or reshelling it ? They've nae sorted my claim yet but hoping to get it back soon. 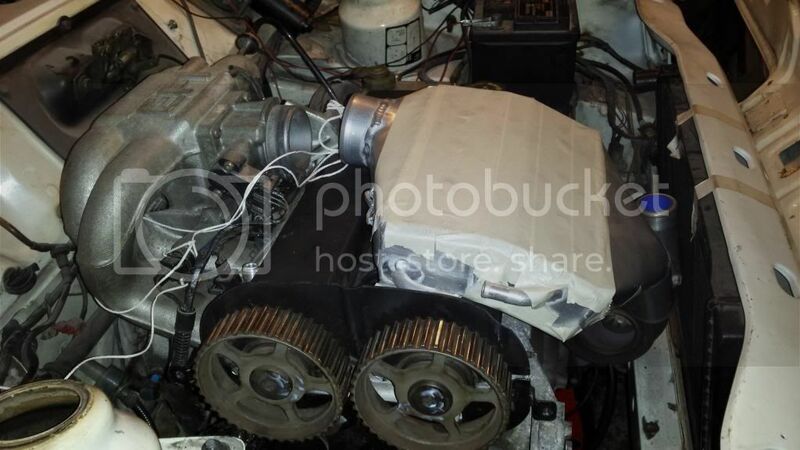 How do I get around fitting the xr2 box to the st170 block ? The sump fails both sides on the shaft and for the starter, also I only have 5 bolt holes that line up which are all above the sump line! Will this be strong enough to hold the two together ? Take a grinder to the sump to get the driveshaft and starter to fit. If you was going to be using it a drag car or a race car then you could modify the sump so it picked up the lower bolt holes on the bellhousing. Most people just fit the bolts on the block and it's fine. engines in etc , only real issue ive found so far is the radiator dont fit what so ever !! any ideas what alternatives there are or will it be best to just get a complete custom made alloy one off? ive also sorted a chargecooler but im unsure whether it will be suitable as its fairly close to the turbo so im a little worried about it defeating the object of the cooler. 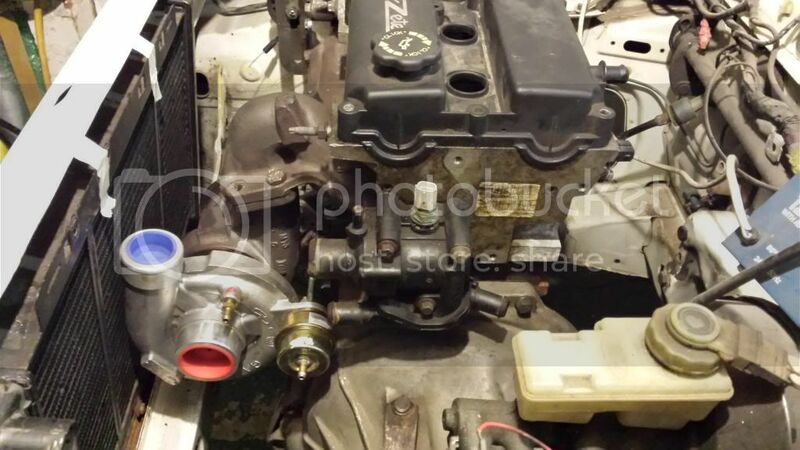 im going to wrap the manifold best i can and fit a heat shield as well to try and keep the temperatures down. its also very close to the bonnet. whatever happened to this one? Still going on just work has taken over ATM and I'm stuck with so many issues. Possibly just go n/a to get it back on the road then turbo it at a later date. Im finally back on the forum! This build is still going! And is still going Zetec turbo! Engine is built and ready to be put in, just doing the bodywork first. The only bit I'm a little stuck with , is which management system to use. Plus I want to be able to get it mapped fairly local and not have to travel the other side of the country to get it set up.